Home > Products > ChargeIt by Jay Gold Hammered Round Melamine Charger Plate 13"
The ChargeIt by Jay Gold Hammered Round Melamine Charger Plate 13" is a beautiful serving piece for your dinner table. 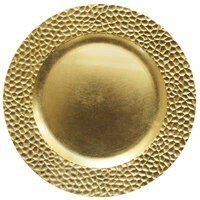 Boasting a unique hammered rim, this charger perfectly frames individual dinner plates at each place setting while its lavish gold finish makes it ideal for layering with white ceramics. Thanks to its lightweight, shatterproof melamine construction, this premium quality piece provides unbeatable durability and longevity. Perfect for multi-course meals, this charger has ample space to accommodate standard size plates and provide protection against spills and mess. To properly clean and maintain this charger plate, hand washing is highly recommended.